The X-Men move against the forces of Sinister! Art- Daniel Acuna’s art is different. Some may love it some may hate it but it still maintains well proportioned and distinct characters though the bright white glow does take some getting used to. Avatar- This issue answers the question of how Colossus can be a herald of both Cytorak and the Phoenix at the same time. Cytorak is an unpredictable and crafty little bugger. The Phoenix 5- This issue does a great job of showing just how obsolete the original “extinction team” is in light of the Phoenix powered members. Storm brought in to keep the team on the straight and narrow now serves little purpose besides being the “black member”. I see problems for this team once the five lose their power. The only logical next step is almost another schism. 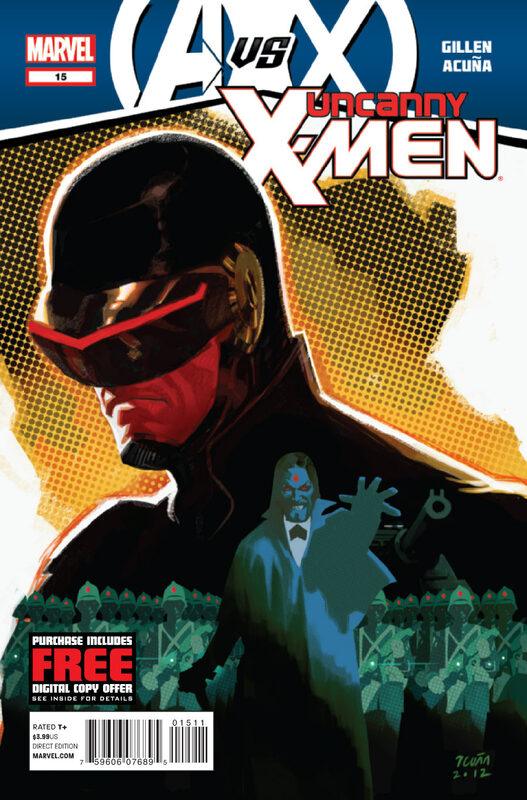 Cover- I love the cover which highlights Cyclops cool looking new visor with the sinister race readying for war. Sinister- One of my favorite X-men villains has been getting some proper spotlight since this book began and this issue proves that he’s still a man of many secrets and plans within plans. This is the Sinister I want to see! His history with Cyclops also makes him the perfect villain for his team. The story also provides a reason as to why the five don’t just nuke the city, it’s a copout but at least the writer is attempting to cover his bases. See Uncanny X-men #13 for complaints. Token….I mean Storm’s use or lack thereof are going to leave more than a few dissatisfied. Some may be put off by the art. ← SDCC- Cyborg in New Injustice Gods Among Us Trailer!